The races for the upriver regattas are always something quite special and this year’s Wivenhoe Regatta truly lived up to that reputation. A dozen BODs came to the line at Bateman’s Tower in 12-14 knots from the south for what proved to be an excellent race. The course took the fleet on a beat out to number 9 followed by a reach to number 8 and then a long run up river to 18 via 12. From there it was back on the wind to 12 again before the final turn for Wivenhoe and a long run which tightened into a tricky and very shifty reach past Fingringhoe ballast quay and into the finish line at Wivenhoe. 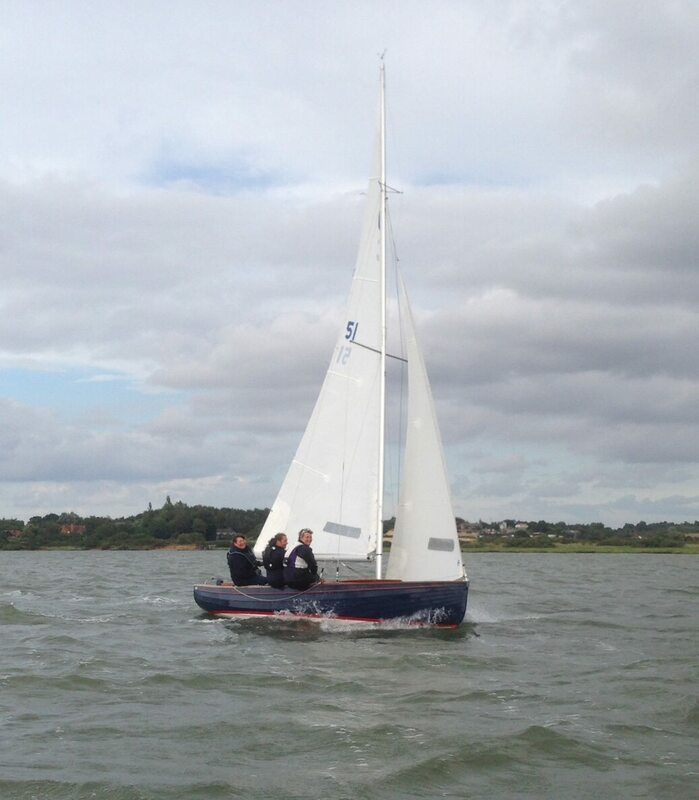 Mark White and C53 White Spirit got the best start at the Mersea Wreck end of the line and led the fleet initially with Malcolm Goodwin racing C4 Cormorant hard on his heels. Behind them Danny Fox sailing C8 Egret, Jeremy Newman in C34 Avocet, Chris Rust sailing C16 Dulcet and John Payne in C11 Grayling were fighting for position on the first beat as the fleet began to sort itself out. Fiona Brown and the girls in Grethe had been the only boat to opt for the Bateman’s Tower end of the line and lost out, as a result they rejoined the fleet off point clear near the back of the pack, but they went for clear air while the others short tacked up the beach and made up ground to round the first mark mid fleet and neck and neck with Grayling. Up ahead White Spirit led Cormorant away on the run and the two boats gradually began to extend their lead over the fleet whilst at the same time enjoying a fantastic duel. Behind them Egret was catching up fast while Avocet and Dulcet battled each other and Grethe and Grayling traded places just behind them. As they approached the drop at number 18 and prepared for the second beat a snafu on White Spirit allowed Cormorant past. On the second beat the fleet was of two minds as to which shore would pay to keep out of the tide. As it turned out those who picked the Brightlingsea shore gained on those who came up on the Fingringhoe side. This allowed Egret to make a huge gain and move up into second, leaving White Spirit third, Dulcet fourth and Avocet fifth. Grethe had made a big gain on the second beat rounding a few boat lengths behind Avocet, while Grayling had chosen the Fingringhoe shore and dropped back. 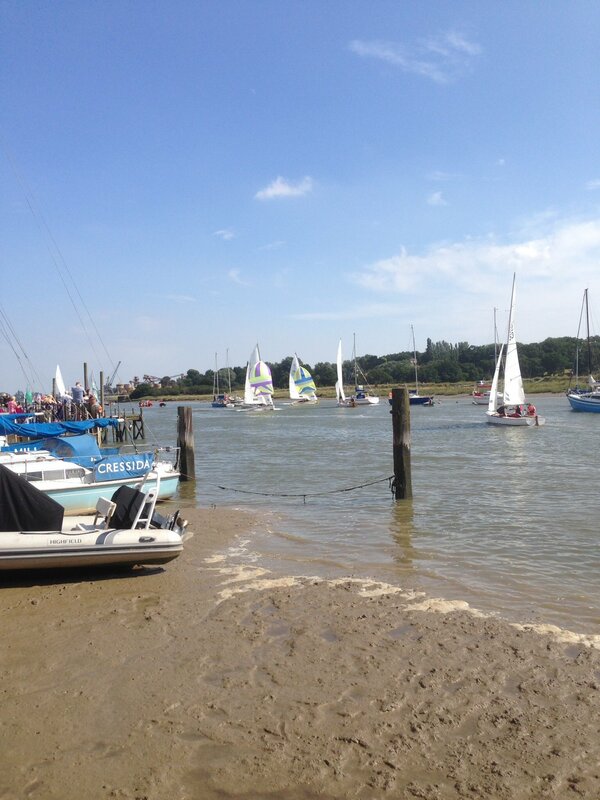 As the boats turned for the final long run to Wivenhoe the wind began to pipe up further making for an exciting run. Cormorant, Egret and White Spirit led away for the line, but Dulcet and Avocet were still locked in a spectacular fight to the finish which Avocet finally won to take fourth in the closing moments of the race. Grayling was fast on the final run and made up ground on Grethe, but there just wasn’t quite enough time to overhaul her so Grethe took sixth and Grayling seventh with the rest of the fleet powering across the line just behind them. Ashore Wivenhoe had laid on a great welcome party with the quay thronged with spectators and the usual free beer and food for all the competitors. As well as the BODs there were also 8 WODS racing who finished just ahead of us, and we were followed home by the ever spectacular smacks who swept through the narrow barrier under full sail and crossed the line with pace and attitude, before making a final hand break turn and dropping sails just below Rowhedge. The organisers had kindly offered a down river race, but by this time the wind was up to over 20 knots and with a very tricky beat off the line and through the barrier the fleet decided that, with Pyefleet Week only days away, discretion was the better part of valour and a cruise home in company would be the safer option. 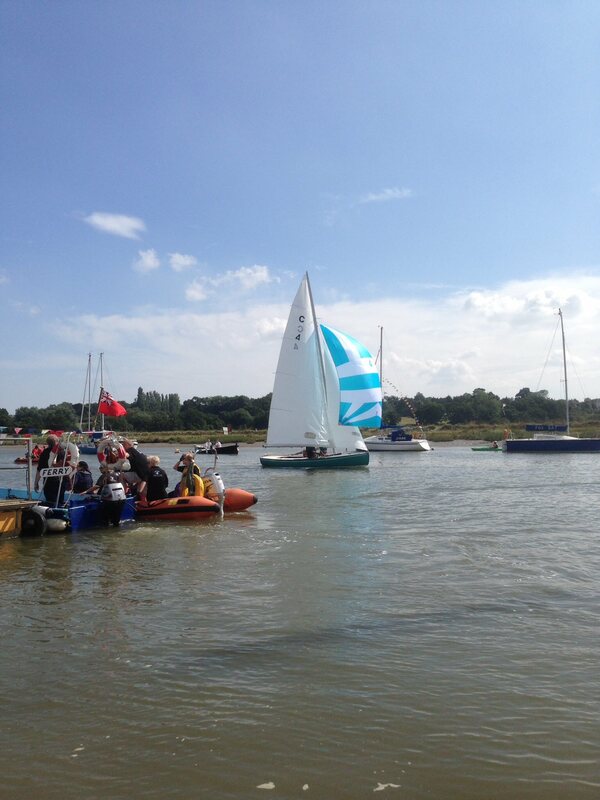 Many thanks to the organisers at Wivenhoe for a spectacular day. We’ll look forward to being back again next year. Our thanks to Colin Spikesley (downriver) and Kate Button (in Wivenhoe) for the photos.